If you haven’t realized it yet, bargain shopping is a true science. Being able to stay stylish while staying in the black is one of the best skills a girl can have. But we all know that money can get a little tight…especially when you really want those designer shoes from the mall. If saving is one of your promises to get your money up this year, then this guide will get you going in the right direction. Bargain shopping might seem easy, but there are little ins and outs than can make all a difference in getting your whole dollar back. It also takes work because sometimes you have to dig for a deal. Learn how to shop and save with style. Because you’ve worked too hard to not be ballin’ on a budget. Really want save money? Then don’t waste a second ogling at the outfits on those mannequins in the store-front windows. 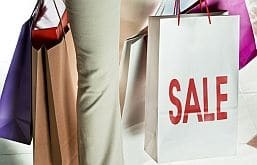 When you enter into any store, whether it’s the mall, department store, or a discount store like T.J. Maxx or Ross, head straight to the “clearance section”. In most stores, this area may or may not be sorted, however it’s the best place to start to find hidden treasures and reduced deals. Usually items on clearance are closeouts from the previous seasons or things that don’t sell. But save yourself from overspending by seeing what’s the cheapest deal you can get in the store. Don’t you hate it when you get a pair of boots for $70 bucks and see a cuter pair for $30 somewhere else? And you just bought it from a shop with a crazy return policy that makes the swap impossible. If you see something cute that you really love but aren’t ready to spend the money on take your time and check out the whole mall to see if you can get it somewhere else for less. Also, giving your time to shop or forget about an item can be a money-saver too. Unless you’re dreaming about those boots tomorrow it might just be best to get your mind off of them to save a buck or two. Buy off-season. It might seem silly, but the cheapest time to get sweaters is after the last snow has fallen. Want a cheap bathing suit? You’ll start seeing them showing up on the $1 rack by the end of July. The retail and fashion industry runs on the future and current trends. But if you know anything about fashion (or just flip through old magazines), you’ll notice that trends get recycled all the time. Remember the ponchos from 2005? They’re back… So don’t be afraid to hit the rack and purchase some outdated items. Ever wanted to buy that beautiful white dress you saw at the mall and then notice the makeup stains around the color? See some deodorant stains under the arm of a cute black sweater? Slightly soiled goods can easily be washed in a machine and reduced for sale. If you find an item that you really love and don’t mind doing some extra work when you get home, and then get the store manager to sell you the item at a cheaper price. Because technically damaged goods should be on clearance anyways. Steer clear of ripped items. But a missing button or two? You can make it work. Outlet stores are a good place to go if you want designer for less. There is question in quality of these products, but you’ll be able to get a Gap shirt for a better deal than you would at the mall. Be mindful though because some outlet stores can be just as harsh on your pocket as those prices in the mall. Who said saving money wasn’t classy? Headed to a department store like JC Penny and Macys? Bring those coupons that they send directly to your house to get extra savings. Trust. That 20% off can do a whole lot of difference. Doing some online shopping? Check out our fave site, RetailMeNot.com to get online coupon codes to use at your online shopping spots. Save on everything from clothes, gizmos, to even contact lenses.